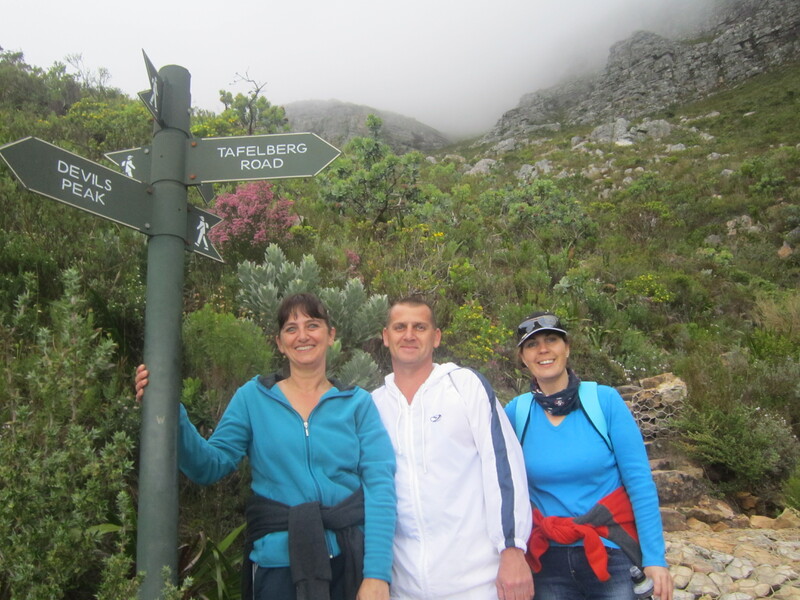 How to hike Devils Peak ~ Tuck and Roll Apparently! My alarm sounded at 5:30am on Sunday morning and I lay there for a moment listening to the wind battering around outside. 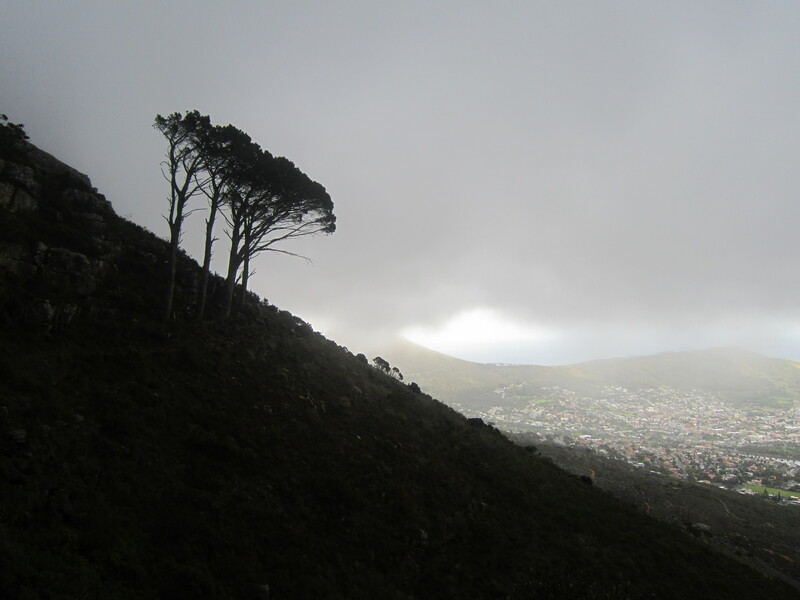 It was still early and the South Easter wind was howling already ~ it was going to make for an interesting hike. 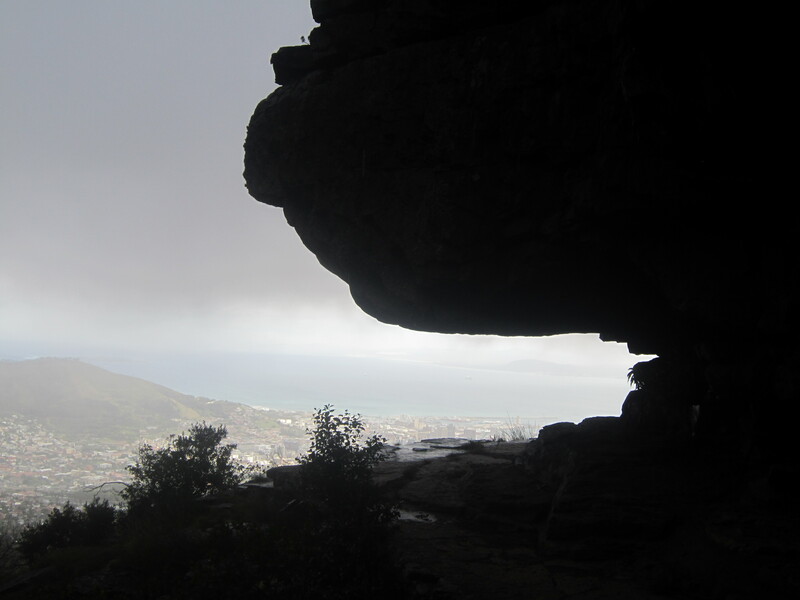 We headed out to Table Mountain to hike Devils Peak, this time from the front of the mountain again. Despite the wind, I was grateful for the cloud cover over the mountain and the cooler weather. The last time I did this hike from the front it was over 38 degrees Celsius! We were due to head up a path further along the mountain, making our way straight up the mountain but arriving so early in the morning the area was still deserted and as one of our other hiking companions, Simon, had had to bail out due to illness, we had no deadlines to get down by a certain time so we decided to head back to the previous trail up the mountain as it was a bit more well frequented. There is nothing quite like adding an extra 5km’s to your hike even before you’ve started! Naturally, we headed up on a long steep stairway, which as usual warmed us up in no time. With all the rain we have had lately the waterfalls were flowing and the scenery was breathtakingly beautiful right from the start. We started our walk making our way up next to this waterfall. 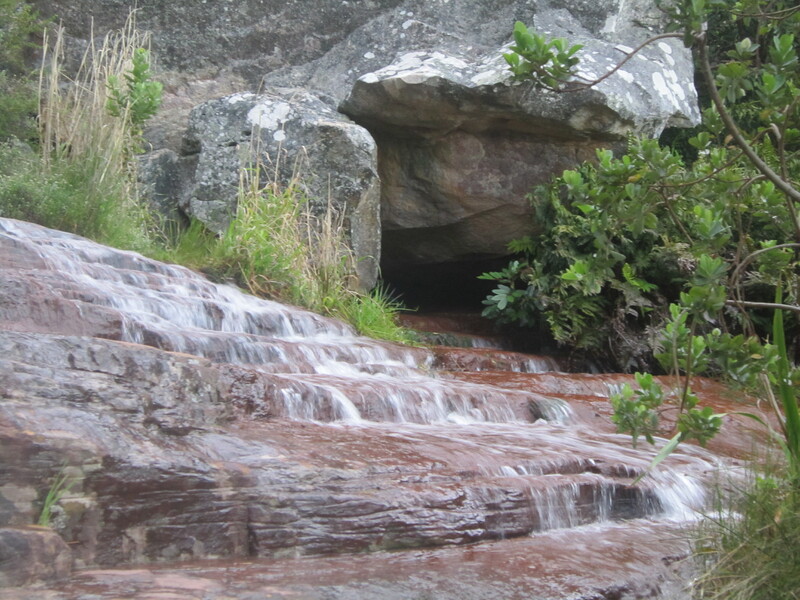 Water cascading over the rocks as we made our way up. We hadn’t gone far but the sound of the water running down the mountain side and the views unfolding behind us as we made our way up reminded me yet again why I love spending time on the mountain. 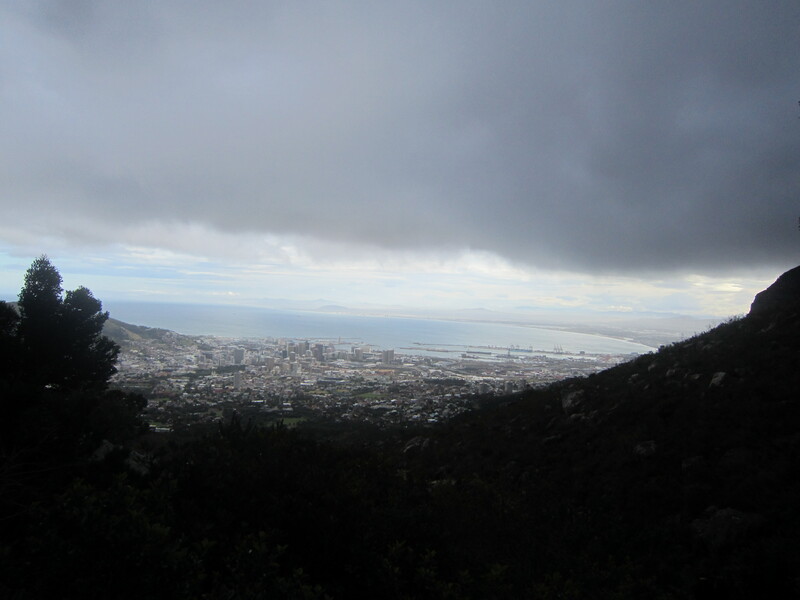 The mountain was covered in cloud but the city, still sleeping below, offering her magnificent views as we climbed higher. The path eventually took a turn to the left and we headed up along some more stone stairs making our way across the front face of the mountain. 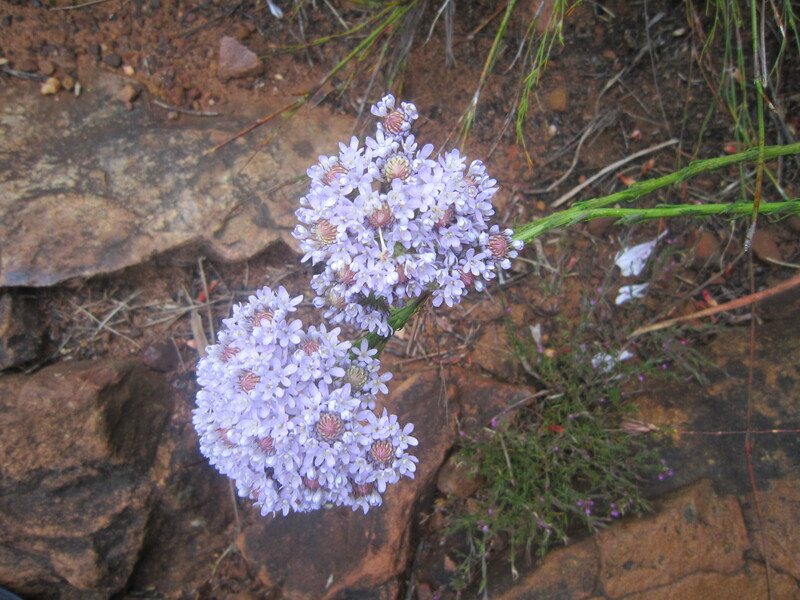 The mountain was alive with colour, after plentiful winter rains the slopes were green and the flowers were in bloom despite the fact that the sun was hidden by the misty clouds rollings over the top of the mountain. 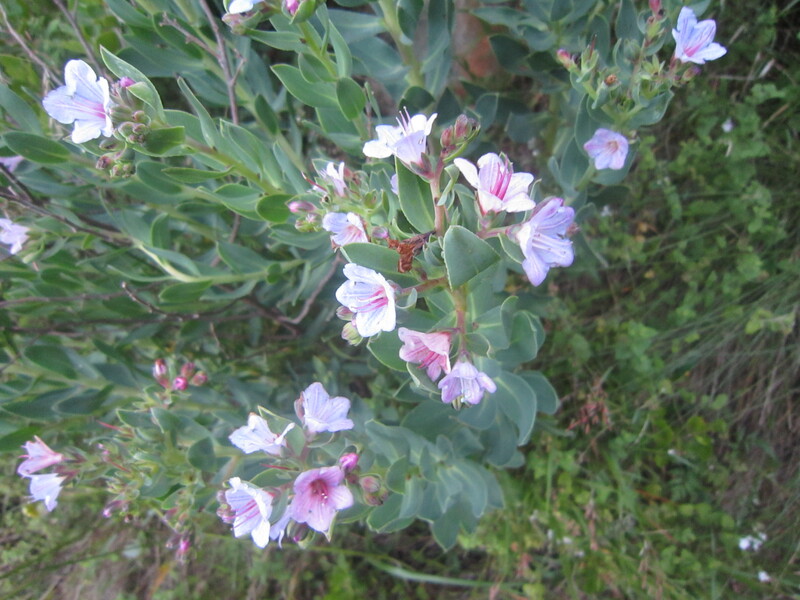 The mountain was in full bloom with beautiful flowers everywhere. The mountainside dotted in beautiful colours. 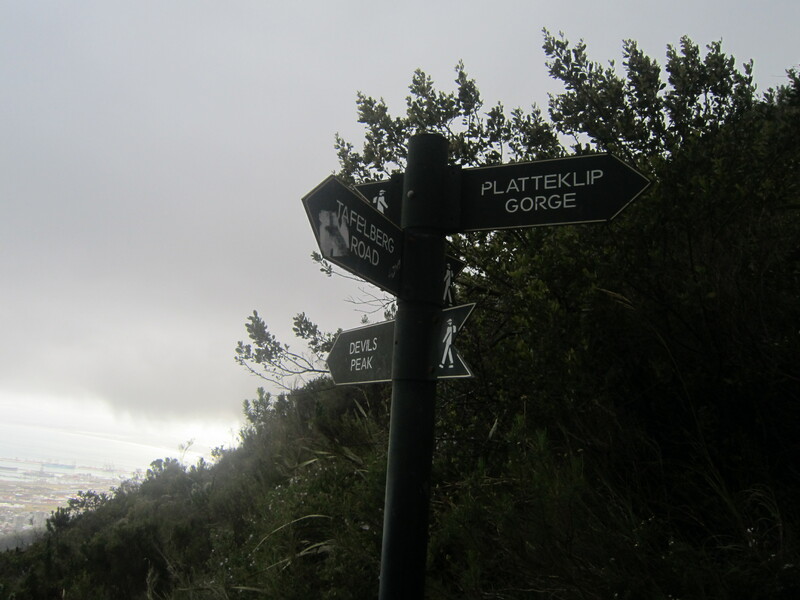 We reached the split in the trail where we could continue along the contour path to were we would ascend to Devils Peak or I gave the group the option of doing Platteklip Gorge, a path of stone stairs that zigzags to the top of the Table Mountain. The reply I got was a resounding no ways! A split in the trail. 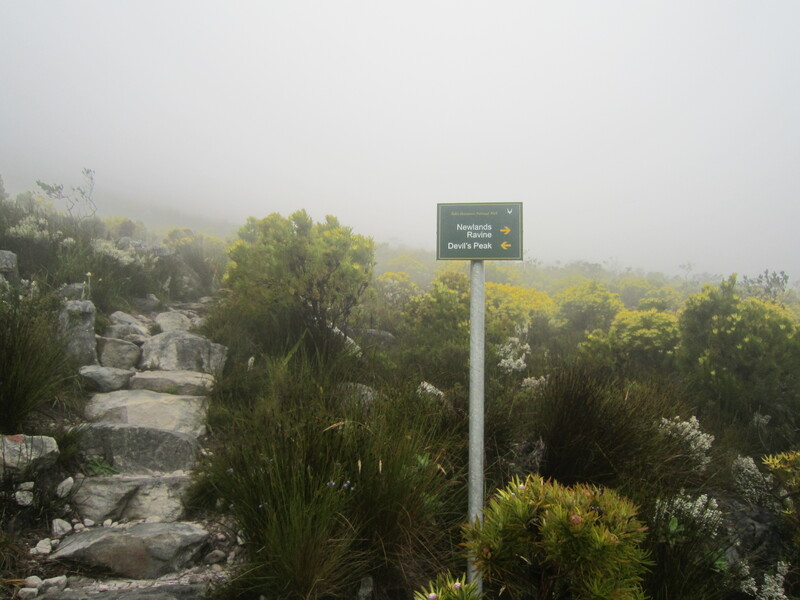 Decision time ~ head up the steep stairway to the top or continue on our way to Devils Peak. We continued along the contour path, every so often climbing up more steps made out of the stones as the pathway hugged the mountain side. The higher we climbed the mistier it got. 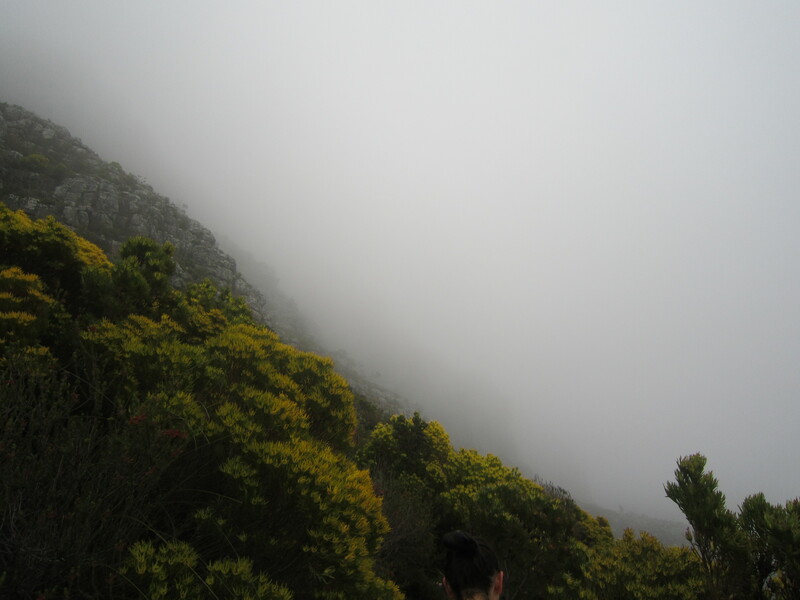 Despite the cloud cover it was warm and the feeling of the cool dampness of the mist was welcome on our skin. It made for perfect hiking weather. The views to our left were of the city below, beautiful as always, the sea blue and clear views of Robben Island in the distance. 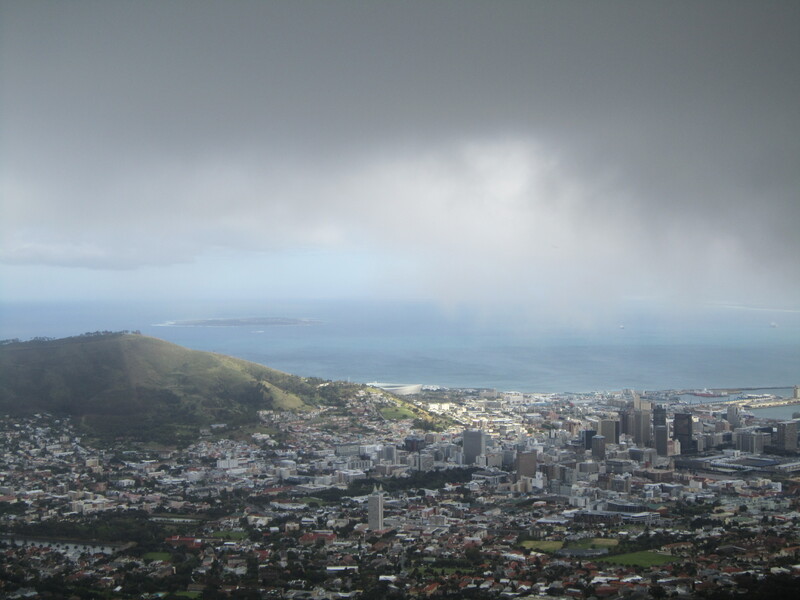 The Mother City, Cape Town harbour & the West Coast below. A rock overhang contrasting with views of the city below. 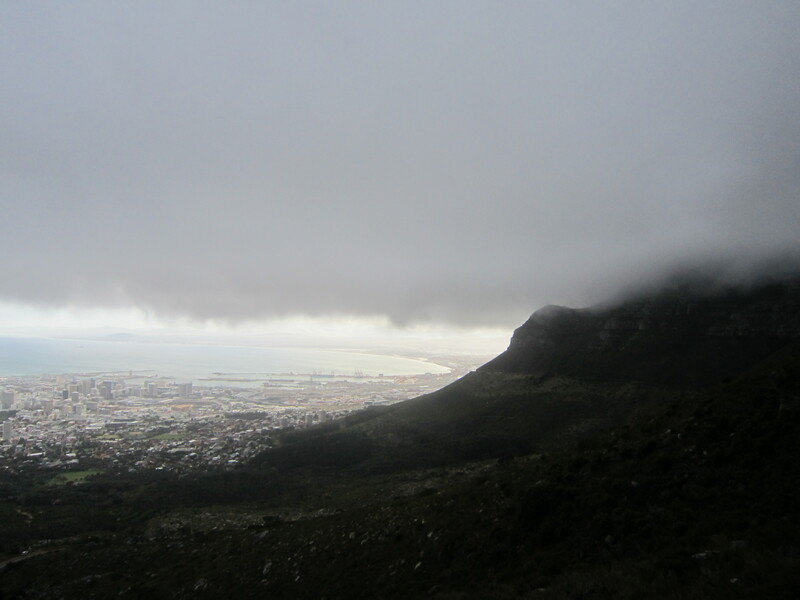 Lions Head and Signal Hill hidden by the swirling South Easter cloud. As we walked we crossed so many beautiful waterfalls, cooling us as we passed with their ice-cold fresh spray of mountain water. 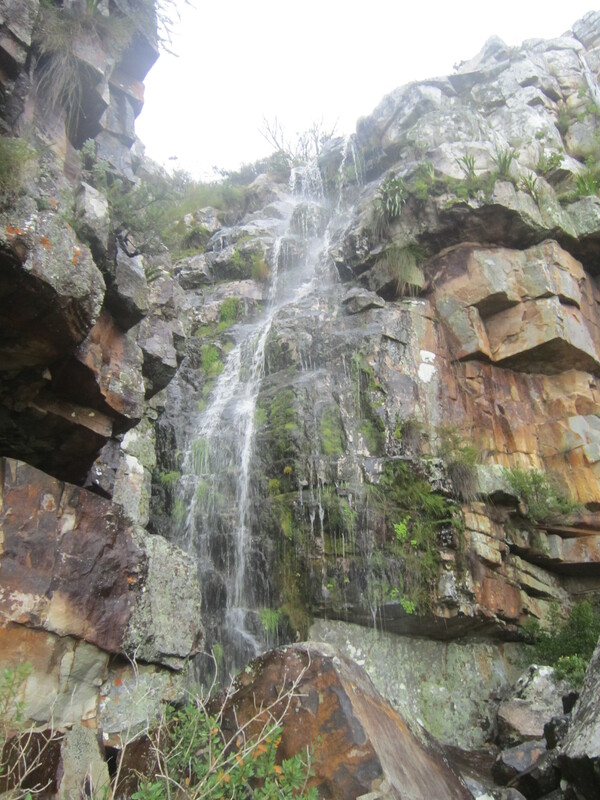 More beautiful waterfalls along the way. 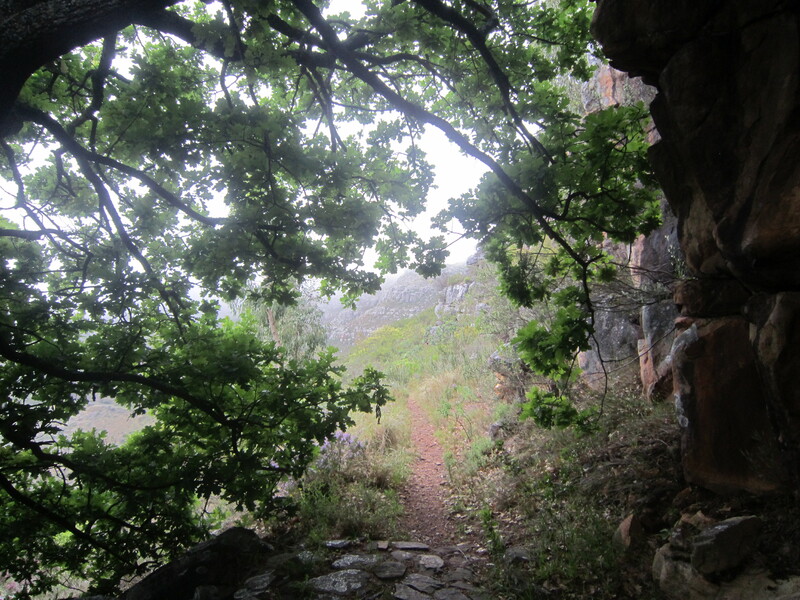 Making our way along the contour path towards Devils Peak. As we walked, we talked, we laughed, we stopped to take the view in. At one point while walking Lynette up ahead stood on a loose rock and did some fancy foot walk which propelled her forward in a run of sorts. Still standing on two feet and moving in the direction of the path to the right and not over the cliff, she was still standing! Natalie, who was behind us, piped up that next time she must just “tuck and roll” ~ this instantly conjured up images in my mind of a hedgehog tucking up into a tight ball and rolling down the side of the mountain! We laughed at the images playing across our minds, which naturally turned into images of Lynette tucked up into a tight ball with just the white soles of her takkies showing as she tumbled down mountain. The banter was fast, the laughter was loud ~ it was turning out to be yet another great day on the mountain! Stunning views of Signal Hill, the city and Robben Island in the distance. 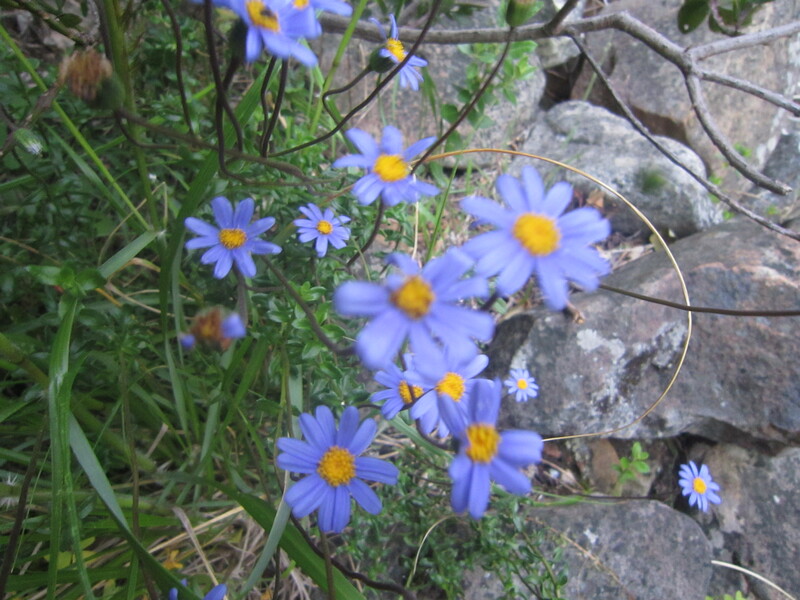 More colours splashing the mountainside. 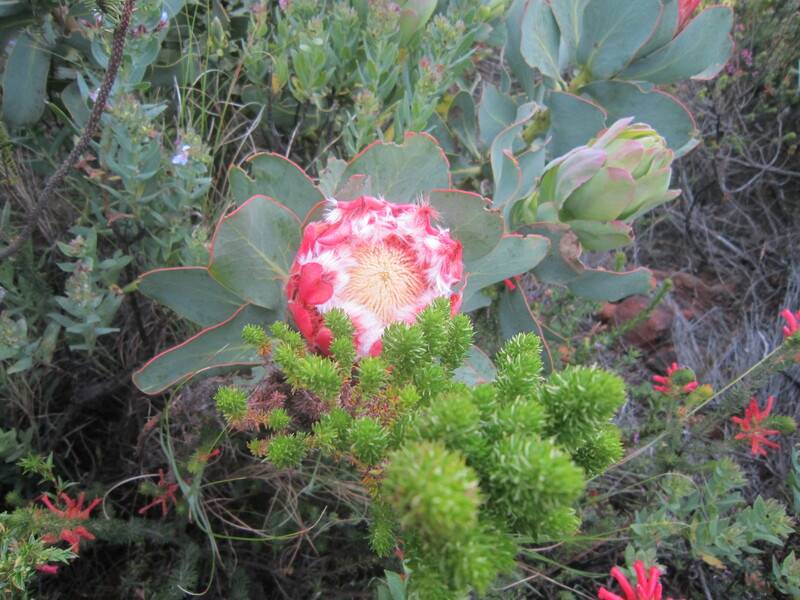 Such pretty protea’s along the side of the path. We came across yet another beautiful waterfall. We stopped to have a snack and take some photos and of course this presented the perfect opportunity to take a self-timer pic of the four of us. Standing at the foot of the waterfall under the spray of the icy cold water, we positioned ourselves, set the timer and I pushed go. With my recently twisted ankle I ran as fast as I could under the circumstances, treading carefully on the wet rocks to get in position in the short 10 seconds before the camera took the picture. In the end we got the four of us in the picture perfectly, only problem was the waterfall didn’t make it in! I promise it really was there behind us! Our group doing a self-timer pic at one of the waterfalls ~ Thanks for an amazing morning on the mountain guys! As we continued walking, sometimes in silence, we listened to the croaking of the frogs and the chorus of the birds. The mountain was alive in every sense of the word. 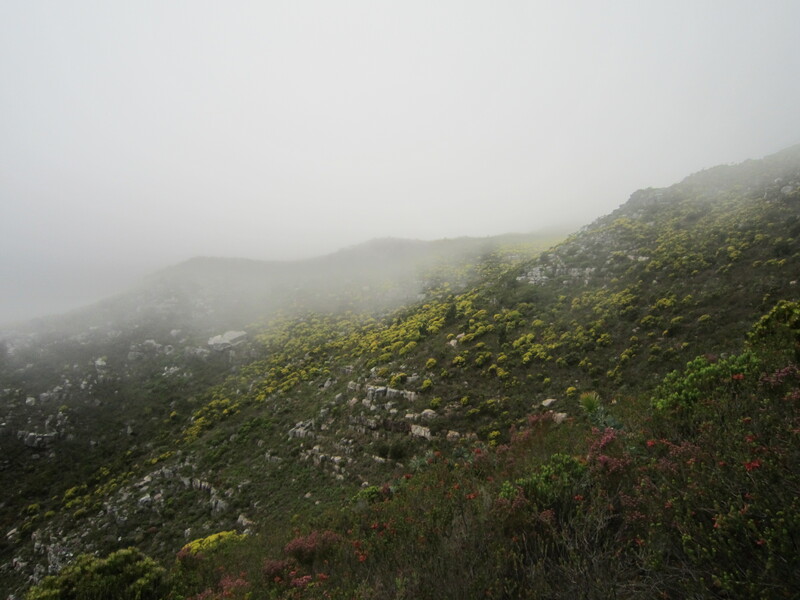 As we walked higher, the misty cloud grew thicker enveloping us in the mystical magical wonder that is our beautiful mountain. Despite the mist the views were simply magical! 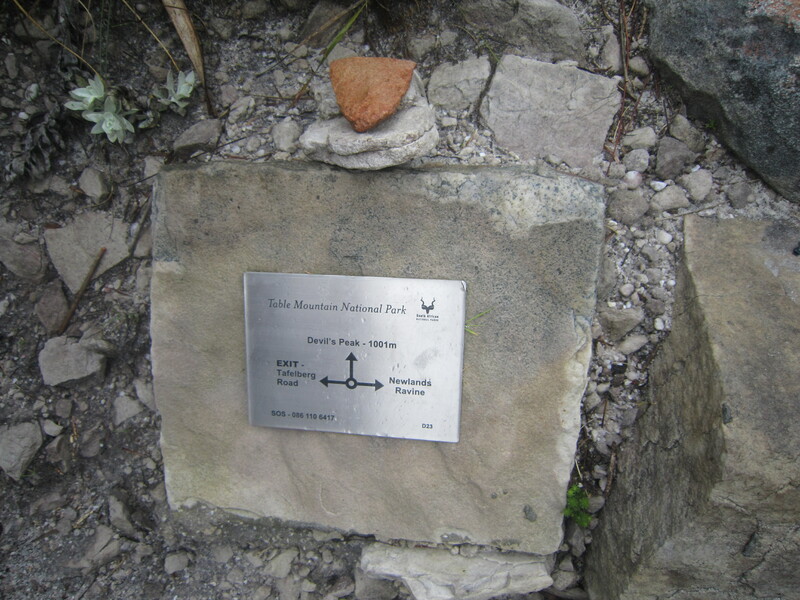 We finally reached the path that would take us up to the saddle and then the summit of Devils Peak. The mist was now thick and it’s amazing how disorientating it can be without being able to see the mountainside and exactly where we were. Only way now was up! We couldn’t see the top, which could just have been a blessing for some not knowing what we were about to climb. We climbed up on a path of loose sand and rocks. The wind at this point was sweeping strongly across the plateau as we began heading up, blowing the mist over and around us, wetting our hair and eventually making us stop to take our jackets out to put on to keep us dry. A light rain began to fall. Some legs began to give way, tired and not wanting to climb any more. Leon took one of the girls backpacks to lighten their load. I assured them it wasn’t much further to go. As we climbed up, moments where others struggled reminded me of my Kili summit night. This was a walk in the park for me but as others dug deep in the howling wind and the wet mist I recalled my own struggle on the mountain of Kilimanjaro not so long ago. “See that tree up there?” I pointed up ahead, “that’s were we going.” “A few mores steps ~ it’s not far to go.” The mist was so thick by now we couldn’t see further than the tree ahead of us anyway. Maybe it was a good thing! The mist was thick and we couldn’t see far ahead. 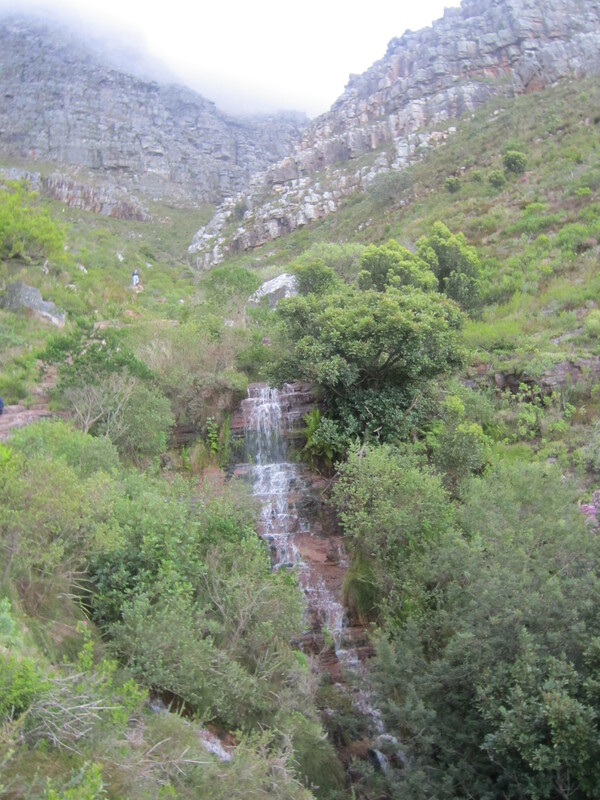 Eventually we reached the saddle, with just a short steep push to the top of Devils Peak. 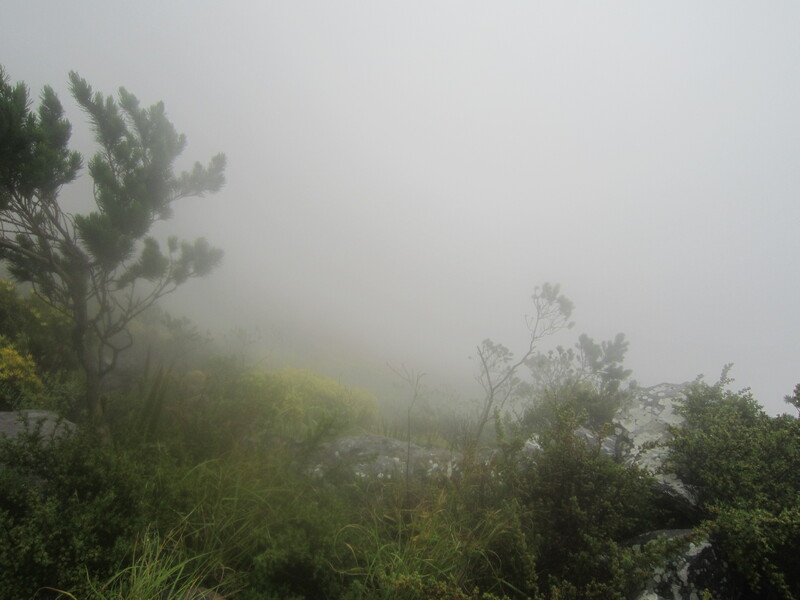 At the saddle, however, the rain began fall harder, the mist was so incredibly thick you couldn’t see where the path led anymore as it disappeared behind the grey sheet of mist. It was windy, it was wet and it was hard to stand on our feet without been blown over. We could hardly see in front of us let alone each other! The wind was so strong up there it was literally blowing us over, right off our feet. 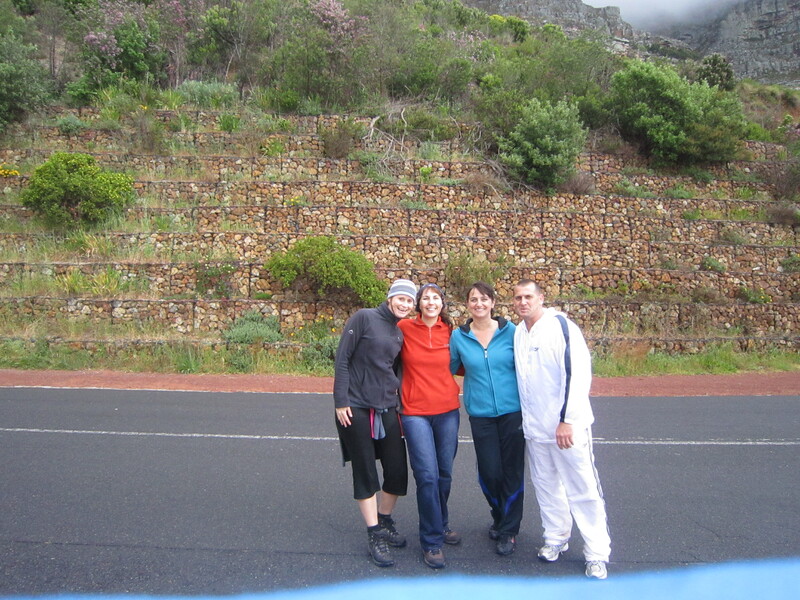 While at the saddle, we met up with two fit looking (read yummy/easy on eye) trail runners who stopped for a breather. We chatted briefly (or should I say shouted above the howl of the wind) before going our separate ways again. 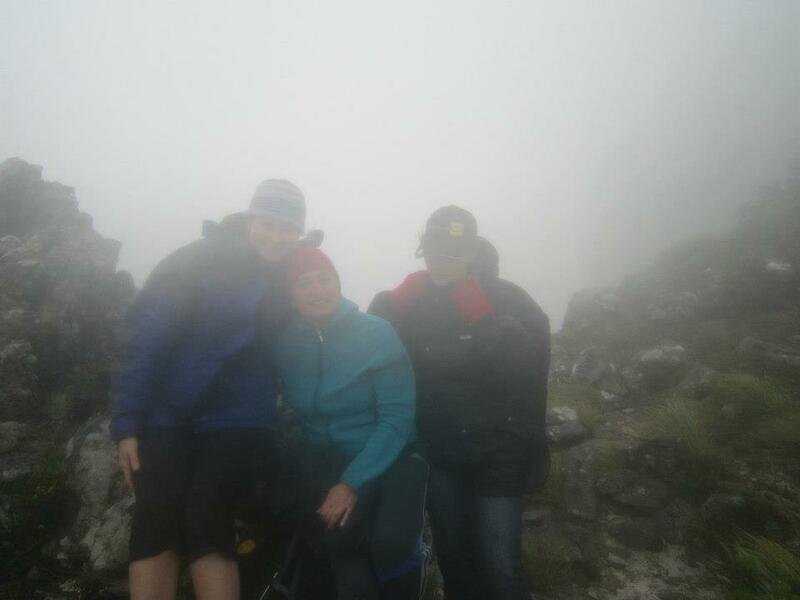 We made a decision there, that with the rain and the mist and wind we wouldn’t go the rest of the way to top. Besides no view to be seen, with the rain and the wind it would have been absolutely miserable and not to mention dangerous on top. We managed to take a photo at the saddle and then slowly headed down the wet slippery path, careful of our footing as we made our way back down. We headed back down looking for a nice sheltered dry place to stop for an early lunch but with everything so wet there weren’t many ideal places to stop. We eventually stopped under the rock overhang where Natalie served warm coffee and we tucked into our lunch while taking in the view of our beautiful city and ocean below. 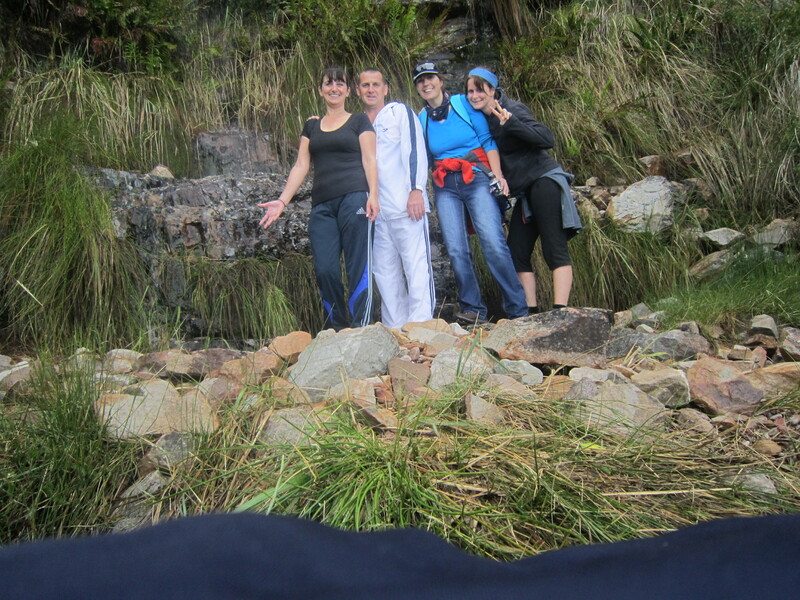 Lynette squished out her water-logged takkies, the small holes to breathe not helping with the intake of water as we had made our way up! 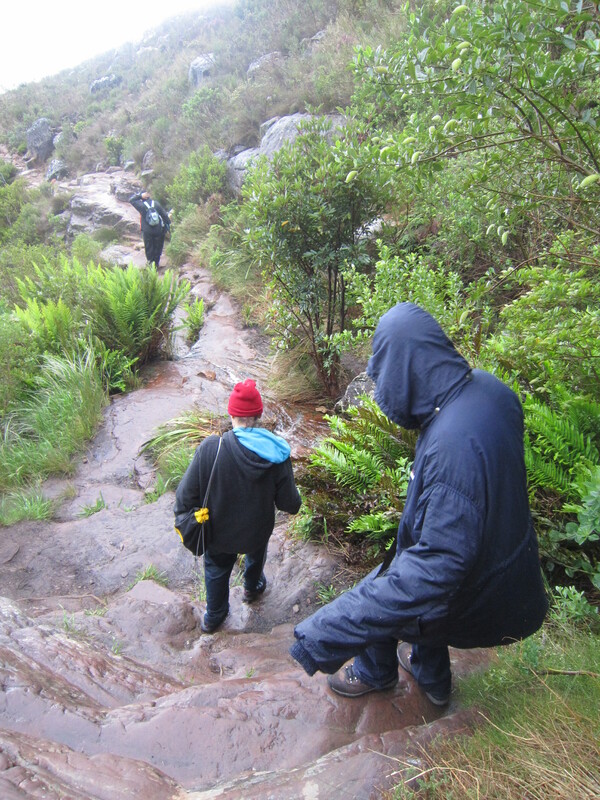 After lunch we headed back down to the cars, careful once again of our stepping over the wet and slippery rocks. Grateful for my strapped up twisted ankle that held over the hike, with only one or two awkward steps that caused a shooting pain through my ankle joint. The girls making their way carefully down the wet rocks. Back at the car, slightly wet but still smiling, it was time for one more self-timer pic! Grateful for beautiful friends who humour me on these mountain trips, for the laughter and new memories made. We left the mountain a bit wet but our souls were full to overflowing with aliveness and smiles from ear to ear with a promise to return on a clearer day so that we can make it to the top to prove to them the 360 degree view at the top is worth those final two steep climbs!